Professionally manufactured by a US stainless tubing company using US sourced stainless steel, ready for use in your electric brewery setup. The longer 50 foot length ensures that heat transfer is maximized and the large 1/2 inch tubing minimizes flow restriction. Easy to install even in tight kettles due to the cross-over design as having the ends come from the opposite sides of the coil allows for more flex. For kettles with an inner wall diameter of at least 16" such as 20 gallon Blichmann Boilermaker kettles (or larger). Coiling the HERMS coil has proven to be one of the most difficult aspects of building our brewery for many users (see some of the failed attempts). STANDARD: 15.5" diameter, 7" high (measurements taken center of tubing to center of tubing). Will work in any kettle with an inner wall diameter of at least 16" such as the 20 gallon Blichmann Boilermaker kettles (or larger). The holes in the kettle wall should be 7" apart (center to center), however we recommend you wait to receive your coil to confirm before punching your holes. SMALL: 11.25" diameter, 9.5" high (measurements taken center of tubing to center of tubing). Will work in any kettle with an inner wall diameter of at least 11.75" such as the 10 gallon Blichmann Boilermaker kettles >or 15 gallon kegs (keggles). The holes in the kettle wall should be 9.5" apart (center to center), however we recommend you wait to receive your coil to confirm before punching your holes. The ends of the coil extend approximately 2" past the diameter to allow the user to cut to the exact length they need as every kettle will be slightly different. Cut the ends using a hacksaw and file the edges smooth with a metal file so that there are no burrs. If you want to get a nice clean cut, use a stainless steel tubing cutter instead as it will create a perfect cut without burrs. Material: 1/2 inch OD 304 stainless steel, 0.035" wall thickness, seamless. Ends: Bent at a 90 degree angle to exit straight out of kettle wall, lining up perpendicular with each other. 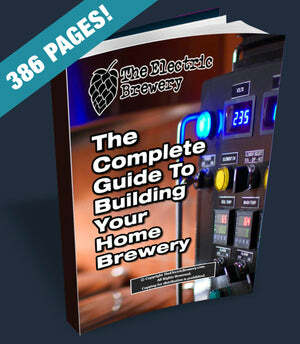 Installation instructions are available in our Complete Guide to Building your Home Brewery or online here. Visit the official Custom HERMS Coil product thread in our forum.